Friday, December 12th, 2003 | 9:12 am	and filed in Reason, Power Tools For Reason, Tutorials. This article was adapted from my book, Power Tools for Reason 2.5 published by Backbeat Books. The example from the Chapter Four section on ‘attenuation’ discusses a particular cabling technique, useful for all Reason/Reason Adapted users. This example is only mentioned in passing, and in retrospect, i should have placed a little more emphasis on the topic. While the material is not intended for the Reason neophyte, anyone can learn from the examples by following the procedures, studying the wiring schematics. Since the introduction of Reason there have been a few issues regarding signal levels. One concerns the levels of preview samples being much louder than the levels coming from the master outputs. The other issue concerns audio fidelity with some people debating that Reason is somewhat “flat” sounding. While researching the chapter on audio signal routing, I discovered that the pan control set at center seems to attenuate the signal. Actually, panning a signal towards the left increases the level on the left mix bus–higher than when the signal is panned center. This shed some insight on the issues, and led to the following discovery. Dual Mono connections are established by connecting stereo outputs from Reason sound modules to two separate mixer inputs. Each of the mixer channels are panned hard left and hard right. Try the following example. 4. Bypass auto-routing (hold down the shift key), and create a Dr.REX Loop Player. 5. Load the ReCycle file, “RnB04_Mpc_090_eLp.rx2” from the Reason Factory Sound Bank\Dr Rex Drum Loops\RnB Hiphop directory. 6. 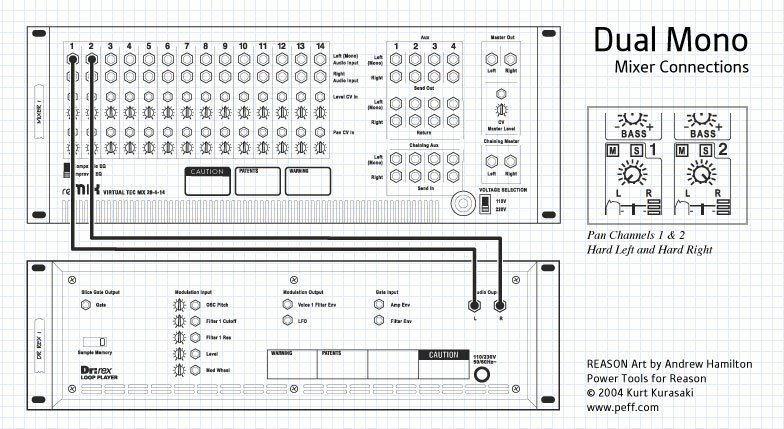 Copy the slice data to the Dr REX 1 sequencer track. 7. Bypass auto-routing and connect the Dr.REX left output to the mixer channel 1 Left input. 8. Bypass auto-routing and connect the Dr.REX Right output to the mixer channel 2 left input. Why Bother with Dual Mono connections? Certainly you can connect stereo devices into the stereo inputs and raise the Dr.REX master output level to maximum or add gain by raising the fader level above unity gain settings of 100. It’s important to maintain high signal levels with digital audio in order to take full advantage of the available bit resolution. Using dual mono connections benefits from the added extra gain, and insures that the signals are hot. For example, the output levels of a Dr.REX module decrease as the velocity amplitude modulation parameter is increased, and the levels are sometimes very low, where raising the Dr.REX master volume and Mixer channel fader to maximum are still not enough. The dual mono connections can add more gain, and help restore the dynamic range. The main benefit of using the dual mono connections is that it provides greater panning options. Stereo inputs are fixed in their pan positions to left and right, however with dual mono inputs you can pan signals to two arbitrary points between left and right. Creating tighter stereo fields can make certain signals balance better in the mix. If you have several stereo input signals, a couple can be panned hard left and right, and the others could be panned to narrower stereo splits like –48 and 47. This will add some depth to the stereo field and balance out elements so they sit better in the mixdown. In theory, there really is no audio quality difference between using stereo or dual mono connections, but let your ears be the judge. The dual mono connections seem to have a noticeable effect on the mix in the following example. Certain elements of the mix seem to stand out more clearly with more definition which lends to an improvement in the fidelity. The sequence is built up around several loops triggered from Dr.REX loop players. The output signals are split with Spider Audio modules, and the signals are cabled into two mixers. 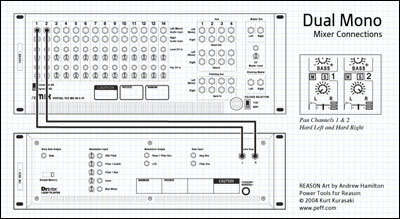 One mixer is connected using the default stereo input connections, and the second mixer is cabled using dual mono connections. Both mixers’ outputs are merged using another spider audio module, which links both mixes to the reason hardware interface. The sequence loops several times, and automation tracks switch between each of the mixes. The mixes are almost identical, so it takes a careful listen to hear the subtle nuances. The first thing you should notice is the higher levels from the dual mono mix as the master output fader is much higher on the stereo mix. If you solo out particular elements in both mixes, the subtle differences become more apparent. During the dual mono mix, the difference is most noticable with the hi-hats on the drum loop—the dynamics between hits are quite vivid. By comparison, the loop in the stereo mix sounds a little less exciting. The main factor is the narrow panning of the drone and deep drum sounds which allow the stereo separation of the REX loop to stand out. The drone of the dual mono mix feels a bit more centered. The subjective art of the mixdown requires balancing both techniques of cabling. Some devices will benefit from stereo connections and others with dual mono connections. Layering up too many sounds in stereo or too many in mono will quickly lead to a track that’s difficult to mix. The Subtractor Synthesizer only has a single audio output, however it can be split using a Spider Audio splitter and wired as Dual Mono signals. The increased gain levels are instantly noticable, but the fidelity change is not quite as apparent unless the dynamics change in large amounts. For example, a sweeping synthesizer patch that changes in loudness and timbre would benefit from the increased dynamic range. Acid synth patterns do not typically benefit by being wired in with dual mono inputs, unless you insert an effect module like a Scream 4 Sound Destruction Unit. The distortion effect might have an extra presence and slightly richer tone with the increased gain. This is one of those tips that everyone should try applying to their old Reason tracks, and hopefully it will help ressurect some of those old projects that seem to get stale after being overproduced (it happens to all of us!). Cabling individual audio outputs to separate mixer channel inputs is tedious, but in the long run, the benefits of increased loudness and pan flexibility can improve the sound of your Reason songs. Try experimenting with different pan separation settings and using a combination of the dual mono and stereo input connections. The variations can lead to surprising results.